Maria Luisa Gonzalez Arechiga was born in Guadalajara, Mexico in 1926. She studied at the prestigious La Esmeralda Fine Arts School in Mexico City, specializing in portraiture and nudes under the direction of Raul Anguiano and Jorge Martinez. During her travels to the US and Europe, she developed a strong interest for the human suffering that is so common in Mexico and upon her return she looks for ways to help the Huichol native communities, starting a foundation for this purpose in 1964. 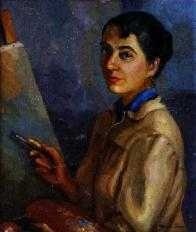 Her first exhibition was at the Casa de la Cultura in Jalisco in 1961, followed by scores of others at esteemed institutions such as the Carmen Ex-convent, Galeria Municipal Torres Bodet, Instituto Cultural Cabañas, Casa de la Cultura de Monterrey and the Palacio de Bellas Artes in Mexico City. During her career she was awarded several accolades both for her art and her humanitarian labor. Maria Luisa Gonzalez Arechiga, a great and discreet figure in the Latin American world of art died on the last days of July of 2009.